This article explains how to produce and market a professional quality audiobook using Amazon ACX. Through ACX (Audiobook Creation Exchange), I was able to audition voiceover talent, choose a professional producer, review the work in progress, and make my audiobook available through popular audiobookstores without spending a cent. The market for audiobooks is currently worth over US$2 billion. Audible.com claims to offer over 150,000 titles. Split that catalog apart by genres and even if you’re small fish, the endless ocean of books available in print or eBook form becomes a small pond. My book is one of only 5,936 books available in the “Personal Memoirs” category. The same category on Amazon.com contains 92,014 titles. As with any form of publishing, a chasm exists between “getting your book out there” and producing a quality, professional product. Reading your book into your computer’s microphone doesn’t cut it. Audiobook production requires professional recording gear and talent. A quality audiobook has no dogs barking in the background, no aircraft flying overhead, and no sirens blasting down the street in front of your house—and though this might sound self-evident, the equivalent happens with self-published printed books all the time. 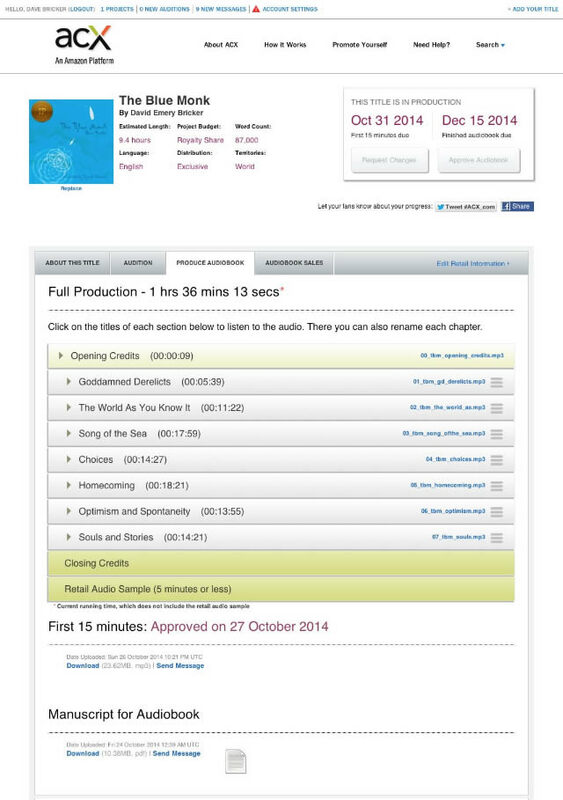 Aficionados of audiobooks can hear “amateur” the moment they sample a self-produced audiobook. Amazon ACX offers an alternative to DIY. This service connects writers with voice talent, monitors production progress, and handles distribution and payments. I used ACX to publish an audiobook version of The Blue Monk, my sailing memoir. I had the good fortune to meet my narrator/producer in person when he sailed through Miami from the Carolinas. The video footage in this article shares our discussions about audiobooks. A half-hour of reading aloud has me clearing my throat and coughing—and I don’t like my voice. I chose option #1. Sign the customary terms and conditions agreement indicating that your book belongs to you and you have the right to produce an audio version of it, that you’ll distribute through Audible and ACX’s affiliate channels, and that you’ll abide by whatever other insidious clauses about arms, legs, and first-born children are buried in the small print. 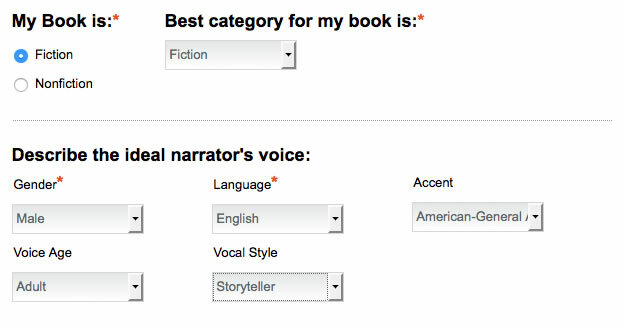 Fill in the book description, copyright information, book category, and desired characteristics for the narrator’s voice: gender, accent, age, style. My solo sailing memoir is written in first person about voyages I made in my twenties. I wanted a youthful, male voice to tell those stories. Here’s your chance to provide directions or advice to Producers who may audition for this book. 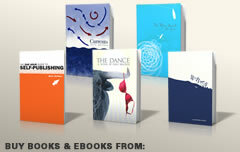 It is also a good place to make your book as appealing as possible to ACX Producers. For example, you can include marketing information, selling points, best-seller status, awards, foreign language translations and reviews. Additionally, please include information about the Author’s reach and fan-base (i.e. 5,000 followers on Twitter, 8,000 fans on Facebook). Part of the magic of ACX is that voice professionals can offer to produce your book for no up-front cost in exchange for a royalty split. Their interest in passing up their hourly fee in favor of partnering with you will be based on the size of your publishing platform. How many followers do you have on Twitter? 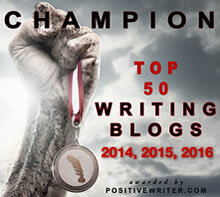 How many page views does your blog get? How many books have you sold? What size audiences do you speak to? Like traditional publishers, voice pros are looking for more than “good books.” They’ll invest in your book if you can demonstrate that you’ve established some mechanism for selling it. Being a great writer is not enough; being a great publisher is what attracts voice talent to invest in your book. Use the “additional comments” box to describe your platform, your book, your reader audience, and your prospects for publishing success—much as you would for an agent or publisher. If your platform is broad enough and you’re already selling books, you may wish to opt out of the royalty split arrangement in favor of simply contracting the voice talent you need. The average self-publisher of a first novel will probably not be an attractive investment for a professional narrator. An already successful publisher will probably prefer a fixed cost. “Up and coming” publishers with a track record will likely attract the most interest, but it costs nothing to try. If your book is engaging, even if it’s an unproven product, you may find a narrator who is happy to take a risk on it to build her portfolio. And narrators are readers; offer a good book that they want to read and you may find a willing collaborator. Though technically part of the project-posting screen, the audition script is an important step worthy of separate discussion. Keep this script short and simple; voiceover artists don’t want to read a half-hour of material on spec. And you don’t want to spend hours listening to audition submissions. If your book uses specialized vocabulary or requires special knowledge of spelling and pronunciation, include instances of that kind of language in your audition script. In the Bahamas, the word “cay” is pronounced “key.” Only one of my auditioners made it over that hurdle. Make your book excerpt interesting. Voiceover professionals will spend many hours with your book. They’ll naturally gravitate toward authors and stories they want to read and engage with. Choose a page or two of your book’s strongest writing. Here’s the script I posted for The Blue Monk. The passage is written with short paragraphs and plemty of space. I wanted a voiceover artist who understood the pacing and tone—how to deliver the experience rather than just the words. I anchor at Powell Cay, a less-traveled island northwest of Green Turtle Cay. Uninhabited, it’s serenely quiet, with beaches devoid of human footprints and a grove of tall, wild coconut palms. On the lee side, dramatic coral cliffs shelter tropicbirds nesting in their season. Affixed to the rocks near the anchorage is a small, bronze plaque—“Cathy Swedenborg Loved This Island”— a shrine to a young woman who died here with her boyfriend in 1979 when their boat burned. Her epitaph is unconcerned with what was lost. Instead, it connects her forever to this special place she found and appreciated, and to her enduring suggestion that I might love it, too. Late at night, I awaken and step into the cockpit. Unadulterated by urban incandescence, untinted by the azure hue of day, the nocturnal world projects its magic for those fortunate to bear witness. The moon is high and bright; the white sand bottom illuminated like a stadium; the lunar light brilliant enough to read by. I step astern, grabbing the backstay for support. A diamond shape moves in the water below me. Giant Atlantic stingrays glide over the bottom: dozens of them. Their dark forms undulate, slow and graceful against brilliant, subaquatic sand; an Escher woodcut brought to life; a moving tapestry of figure and ground; a dream landscape. Such sights may be common. Stingrays may congregate here regularly on moonlit nights—or perhaps—only once—tonight. It doesn’t matter; I am blessed to witness a secret world of shadows and light. Cathy Swedenborg loved this island. ACX narrators post samples of their work. You’ll find over 31,000 of these samples on the ACX site at https://www.acx.com/ss that you can filter by age, gender, style, willingness to work with royalty splits, etc. Through ACX, you can invite any of these narrators to consider your project. And narrators are always cruising the new ACX submissions for projects that fit their interests and styles. I received a number of excellent audition recordings within a week of posting my audiobook project. As noted earlier, only one of the voice pros didn’t trip over “cay, but that would have been an easy problem to correct. Mostly, I listened for a reading where the voice didn’t overshadow the story. I wanted to engage with the narrative more than the narrator. One thing I didn’t worry about was whether or not the narrator sounded like me. Every reader of the printed version of the book will “hear” the text in his own voice, anyway. I chose Russell Stamets over some able competitors. Russell is a sailor who records audiobooks aboard his boat. He knows the nautical terms and the tropical island landscape. And though his speaking style is different from my own, I liked the tone and pace of his audition. I loved the idea that an audiobook about sailing would be produced aboard a cruising boat, and Russell recorded the whole project as he headed south from North Carolina to Florida in preparation to follow in the wake of my own voyages. Make this about half a second longer. (Sorry to be picky.) Need a good breath between sections here. Every revision references a specific time in a specific chapter—which makes it quick and easy for your narrator to navigate to where the problem is and fix it. My audiobook is over 9 hours long—and this is typical. Make time to listen to every second of the audiobook and check revisions after they’re posted. Your narrator will put in six times more production hours than the final length of the book. Honor that effort and your own by listening and participating. When you’re finished, you and your narrator must both confirm that the audiobook is ready for release. Your audiobook’s status will show as “processing” for a few days until ACX converts it to the format used by Audible.com, iTunes, and Amazon. Every audiobook includes a preview (shouldn’t this be called “pre-hear?”) sample. This is usually a few minutes long (longer than the original audition script) to give prospective listeners an opportunity to get a feel for the experience your book delivers. Listen to Russell Stamets read excerpts from The Blue Monk here. Prices are set by ACX based on a formula that isn’t exactly clear. The length and genre of your audiobook are probable factors, but publishers have zero control over pricing. ACX takes a 60% royalty on every audiobook. In traditional retailing, the seller takes a 50% cut, but when the product requires no shipping, shelf-space, or handling, the role and responsibility of the seller is greatly diminished. Russell (mostly Russell) and I invested at least 60 production hours in my audiobook; I’d feel better if the seller didn’t feel entitled to a majority stake in the venture. In our royalty sharing agreement, Russell and I split the 40% that’s left after ACX takes its commission. How about a 3-way split—at least? See http://authorearnings.com/acx-lowers-royalty-rates/ for comments on ACX’s royalty structure. ACX promotes the production of audio content by professional voice actors. But the royalty structure encourages self-recorded audiobooks. Will audiobooks join the mountain of self-edited, self-designed print books that have stigmatized indie publishing? Will voice actors continue to invest hours in books they’re paid only 20% for? If you want non-exclusive publishing rights (so you can distribute through channels other than ACX affiliates), you must pay a flat fee for production (no royalty split), and accept a 25% royalty rate. The online software with which ACX enables writers and voice professionals to find each other and collaborate is valuable and surely required development dollars. I don’t question the real value of ACX, but ACX would be worthless without writers, publishers, and narrators. I’d like to see ACX price itself in a manner that recognizes the value and hard work invested by the creative people who make the products being sold. Amazon’s 30% royalty on eBooks seems more in line with a strategy for building relationship with publishers. ACX’s requirement that an audiobook be made based on a previously published book closes the door on publishers who might otherwise choose audio as a path for launching a book. No other format—including eBooks—can deliver a quality product without the purchase of design services and/or technology. If a publisher and a narrator want to collaborate to launch a new book in audio format, why prevent them from investing their time and talent? ACX allows publishers to connect with professional voice talent of every conceivable style. For a first-time audiobook publisher, this is a huge win. Where else can you post a project and receive auditions from several talented producers? The option to offer producers a royalty split means your audiobook can be produced essentially for free if you find the right collaborator. ACX facilitates communication between you and your narrator. Trade emails. Track milestones. Approve the work. Listen to the recorded chapters and suggest corrections. ACX manages every aspect of production and communication about production. 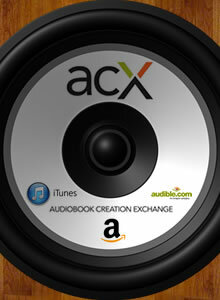 ACX handles distribution through popular audiobook stores, tracks sales, and collects payments. My memoir is not a book that will likely sell thousands of copies. The Blue Monk was created more as a personal literary art project than as a commercial product, and I wouldn’t have invested cash to turn it into an audiobook. (My publishing income is derived from book coaching, editing, typesetting, and cover design—not from selling retail products (books) that produce $5 per unit.) If you have a platform from which to tell an audience about your book, but no sound business reason to invest in professional audio production (as is the case with the majority of self-publishers), why not attract some voice talent and audiopublish as a shared venture? An added bonus of ACX is that you get to hear your book read aloud. If you failed to catch any mistakes, omitted a plot detail, or made an accidental temporal jump, you’ll find problems with your ears that you’ll never find with your eyes. Hearing your book read by a voice other than your own provides a sense of what it feels like for someone else to read it. Listen to your narrator’s tone and timing. Your manuscript is ideas converted into pixels. Your narrator will convert those marks back into ideas, and you’ll know instantly how well-equipped your prose was to survive that transition. As a publisher, I share the fantasy of selling a bazillion books, but as a creative writer, my joy comes from sharing my work with others. I developed the <PubML>® web-based eBook format and made The Blue Monk available with supplementary video, images, maps, and popup footnotes for everyone to read online. I created the Kindle version using my own <PubML>® ePublishing tools. Adding the ACX audiobook channel puts one more medium to work for me by expanding the scope of potential consumers and placing my book in a much smaller library where it’s more likely to be found. Publishing through resellers is an inherently unfair process. Unless you’re selling books directly to readers in a non-bookstore venue, the pie slices disappear way too quickly. But ACX provided me with the opportunity to choose from a selection of professional voice actors, and I was able to use the ACX tools to make that collaboration work. I got professional production by sharing money I wouldn’t otherwise have made—a compelling reason not to look a gift horse in the mouth. I enjoyed the process, made a friend, and expanded my published offerings. I call that a win. I have submitted an anthology of short stories celebrating advancing years to ACX on a shared-royalty basis as I couldn’t face reading it myself and feel it should be left to the professionals. Does anyone know how long it might take to find a reader/producer? I got responds within days. It all depends on how many narrators who fit your stylistic requirements are interested in your project. You can also find voice talent on ACX and pitch your project. Thanks Dave. Not sure what you mean about finding voice talent on ACX. Being pretty ancient (like 84), I find navigating my way through new procedures quite baffling at times. go to http://acx.com/ss . There you’ll find 23,000 audio producers to consider for your audiobook. Holler if you get stuck. And what would life be without that? Best of luck to your audiobook. I think you’ll find ACX to be a fun experience. Read the article you just commented on! Since I have my own little studio where I record all my musical demos, any tips on what the giveaways might be? I know the basics: no background noise, quality recording, etc. I did the audio version of my first business book, but don’t promote it. I want to do the audio versions of my mysteries, but don’t want to come off as amateur there any more than I would want to in print. Joel, you’re a musician of at least semi-pro calibre—which means you have some sense for timing, tone, melody, balance, etc. Having the equipment is only a piece of it. Do you have the voice? It’s not as if most voice actors go to school to learn elocution and sound engineering, but those who focus on voiceover learn the art over years. For most people—not all—recording your own audiobook is like designing your own cover. A few get away with it but the majority don’t even understand the visual crimes they commit against their own books and against the self-publishing world. Like you, I have an audio/music background, but I imagine getting good at narrating requires reading and producing quite a few books. As with any art, there’s no shortcut to mastery. Most useful, Dave. With over 40 years of public speaking under my belt, including hundreds of hours of reading aloud to groups of all sizes and compositions, I think I’ve got that part sorted. I just don’t want to be the guy on American Idol whose friends told him he really could sing Bohemian Rhapsody. Very interested in any feedback or cautions. I wonder if listening to an audio book would be good research, since, I’m just realizing, I never have. D’oh. A mite obvious, that. I’m a narrator and have so far only worked through ACX. It is a tough job. I spend around 6 hours per finished hour of audio for very little return so far. I’ve done 3 titles and am contracted for another 4. One thing that you didn’t mention, Dave, is the possibility of a stipend. This is a program currently run by ACX to get narrators to submit auditions for the royalty split projects (by far the most prevalent of offerings for audio book gigs). If ACX believes that an audio production of the book will bring in money for them, they will offer the narrator $100 per finished hour out of their own pocket to produce it – pretty sure this has to be agreed to by ACX before the request for auditions goes live). This is in addition to the royalty split and is paid to the narrator after the book has been completed and approved by the author. If what I’ve read on their site is correct, the author can contact them and ask if they would offer the stipend for that book. Needless to say, if the narrator knows they will definitely be paid something for the many hours of work, they are much more likely to audition. Where do you think the royalty split issue will likely end up? I’ve got a modest success in a dark fantasy but have hesitated to jump into ACX precisely for this reason and the restrictive distribution rights. Couldn’t I just do all this by finding my own narrator and production studio, then distribute on my own through distribution partners like ACX and others? Great article. Really helped me think a bit more about this particular track. Thank you. The distribution is where the hook is. If you want to distribute through Amazon/Audible, ACX is the entryway. And yes, you can find your own voice talent, pay for the service, and upload on your own, but you can do this through ACX anyway and probably have more choices. The royalty split will probably continue to favor the big booksellers across all media. They control the market and we buyers give them that control. Most customers want convenience over competition in the same way that they prefer “security” over freedom and privacy. Prices and royalties will be set more and more by the seller. The manufacturer of the product will have no say. Interesting and thanks for the good info. A bit too late for me to do now since I self-published my memoir in 2009, entitled The BadassBureaucrat A Memoir by Arthur Murray. However I managed to get it listed on Amazon Books at the time, without marketing. Written primarily for family history reasons not money. It dealt primarily with government fraud,waste and abuse. But recently a government study disclosed widespread misuse and diversion of taxpayer money throughout the system that was endemic. That had been my primary motivation to write the book. So this might be the right time to get marketed. I wouldn’t need Amazon ACX since I had a voice-over professional rendition made (6 CD pack) in addition to paperback copies printed. But, had not sought widespread advertisement until now. One of the options offered by ACX is to upload an already produced audiobook. If you own the rights, submit your audio and jump in. And you won’t have to share royalties with a narrator. Found you on Linked In…I looked at this audiobook feature a while ago and wondered if it was workable for children’s books. Any thoughts on that? Probably not for the young ones. Kids’ books tend to be short reads and at that age, we’re better off encouraging them to learn to read. FYI, Dave, listening to audiobooks while following along in a book is one of the transitional steps for kids to learn how to read, or improve their reading skills. Kids need to hear the modeling of a competent reader. Former middle school special ed teacher chiming in here. “While following along” being the important caveat. I agree with you, but have my reservations about audio-only children’s books. My 9-year-old daughter devours Harry Potter books, but when I taught at the university, only a small minority of my students read for pleasure. Anything that instills literacy at a young age is good—including audio accompaniment to printed books—but we al have to keep our eyes on the literacy ball. Thanks for correcting me on this, though. Annamaria, what type of children’s books? Picture books or chapter books? Published in conjunction with a hard copy book, or targeted for the remedial market? As a former special ed teacher, I can assure you that there’s a market for good children’s audiobooks that don’t talk down for the kids who are still struggling with reading. Listening to a competent reader read while following the text is one means of remediating a reading disability. Super interesting and informative, Dave. Although it doesn’t fit my needs right now, I’m sure to pass it on to others, who might find it immediately useful. Thanks, Jan. All the content on the blog is for sharing as long as you don’t re-post it verbatim (Search engines hate duplicate content). Spread the love around.